You can help fundraise for Men’s Health by joining an existing event or holding your own fundraising event. There are always lots of events you can join in with to fundraise for Men’s Health. Find out what’s going on in your area and join up. It might be the Auckland Marathon, Round the Bays, Stadium Stomp, the REV cycle, Round the Bridges in Hamilton, the Queenstown Marathon, the Rotorua Marathon, or some other event you can enter. Just get your ticket, set your goal, and you’re ready to set up an online fundraising page for the Men’s Health Trust. To set up your fundraising page, go to EverydayHero. Check out our Fundraising 101 section for all the tips you’ll need on setting up a successful fundraising page. We love it when our mates come up with their own fundraising ideas. It might be a quiz night, a shave-off, a party, a concert, a raffle, a sports day, or anything else you think might be a fun way to raise money for Men’s Health. Send us an email telling us what you’d like to do and we can help you organise it. You’ll find some great fundraising tips in our Fundraising 101 section below. Go to our link on the EverydayHero website to set up your own online Fundraising page. Your supporters can then make donations directly to your page and you can see how much money you’re raising. All the money donated goes automatically to the Men’s Health Trust so you don’t need to worry about transferring the funds. This also makes it more secure for your supporters, because they know the money they give you is going directly to your cause. Your fundraising page should be easy to set up following the prompts, but if you need help, just send us an email (with the subject line: Setting up fundraising page) and we’ll give you a hand. Use a photo of you doing what you’ll be doing in your fundraiser. It helps tell your story and it helps your supporters form an emotional connection with you if they know what you look like. 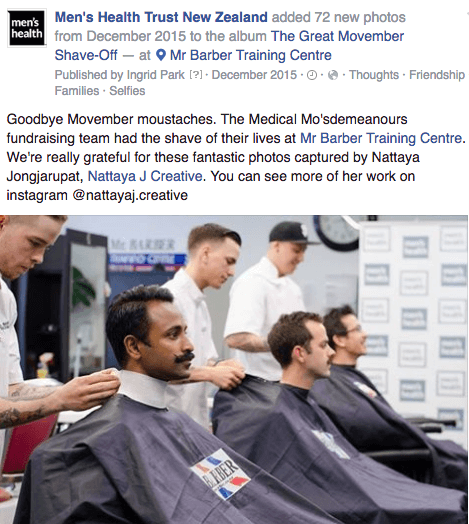 Write a post on Facebook, and create a Facebook event. In your post, ask people to donate to your fundraiser and include a link to your fundraising page. Again, make sure you include a picture – and tag yourself in the picture so your mates and family are more likely to see it. Facebook is very instant, so your post might get buried at the bottom of newsfeeds pretty quickly. Also, just because people read your post, most people won’t click through directly from your post to make a donation. So, particularly with family, it’s good to send a quick email about what you’re doing and ask them to give you support and donate to your cause that way. It’s useful to have a quick email template made up that includes all the information about what you’re doing, with a link to your fundraising page. Then when people say to you: “Great cause – I’ll support you”, you can just flick a copy of that email straight through to them. You want to make it as easy as possible for people to find your online fundraising page. If Men’s Health is a cause you care about, we recommend you get some skin in the game. Make the first donation to your online fundraising page yourself to get the ball rolling. When people go to make a donation, they will see that you’re supporting the cause too. Just because you have an online fundraising page doesn’t mean all your money has to be raised online. You might want to host a sausage sizzle outside your local hardware store, throw a raffle at your workplace, or sell items on TradeMe to fundraise towards your goal. If you need collection buckets, or other help, phone us or send us an email (with the subject line: Help me with my Fundraiser). To transfer the money to us, follow the instructions on our How You Can Help page.